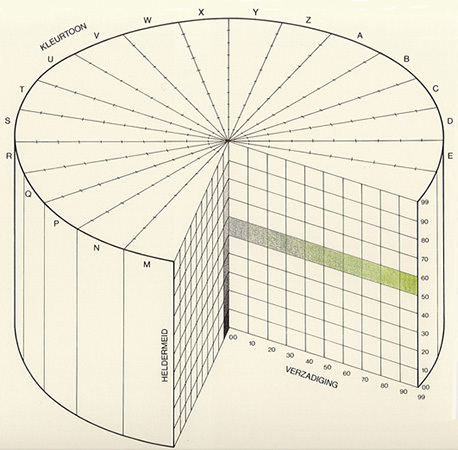 The «Acoat Color Codification», a cylindrical colour system developed by the paint industry (Sikkens GmbH) to describe colour surfaces, originated in Holland in 1978. Theoretically, 2.4 million colours can be calculated with this system, but for practical purposes roughly one million opaque, transparent, gloss, metallic and other surface colours are of interest. Using the techniques of colorimetry, the ACC system is intended to facilitate the uniform supply of colour-batches and colour-charts while attaining clarity through even spacing in the system and economy through the avoidance of complex conversion procedures between perceived and actual values: to offer, in other words, economically priced colour samples. The colour-circle forming the basis of the ACC system comprises 24 chromatic hues («kleurtoon») which increase in saturation («verzadiging») radially from the centre outwards and vary in brightness axially. 100 gradations are provided for each of these parameters, identified by numbers 00 to 99. The segments of the colour-circle are focused on the four basic-colours and are assigned characterising letters starting at red (A), running through yellow (G), green (L), blue (T) and back to red. To enable finer subdivision, intermediate numbers from 0 and 9 can be introduced. The exact coordinates of the ACC cylinder are closely related to the CIEL*a*b* system. 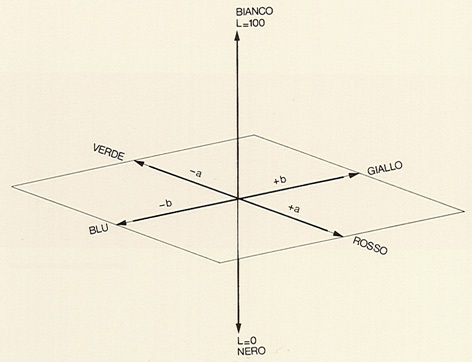 In other words, the ACC system relies on the «perceptual equidistance» of the CIEL*a*b* system. The lines of equal chromatic-hue are like beams, emanating radially from the source of the coordinates. The construction is open towards white and black, allowing new degrees of brightness to be introduced without the need to change its geometry. White and black thus relinquish their precarious positions at the poles of spheres and cones. Evidently, the ACC solid also accommodates colours which are brighter than pure white (for example «dayglow» colours), although it must, accordingly, forego very dark shades which in reality are seldom encountered. The exact coding of colours complies with a six-character classification in the sequence: chromatic-hue, saturation and brightness. The code C2.55.80 identifies a bright red-orange with low saturation, and G0.55.80 implies a yellow colour of medium saturation and of very high brightness. Despite simple formulae, any attempts at characterising the Dutch ACC system colorimetrically in order to bring it into line with the German DIN-System or the Swedish NCS-System systems will meet with difficulties: the European industrial nations have selected their systems in such a way that individual national standards are not accounted for. When a united Europe finally arrives, it may well be a correspondingly colourful event. Date: The colour cylinder was designed in 1978 for the paint industry. 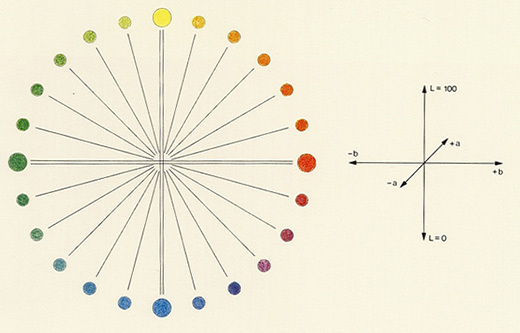 Basic colours: Colour-circle with 24 different «chromatic hues» and basic colours yellow, green, blue and red. Bibliography: «Acoat Color Codification System: Handbuch für Farbgestaltung», Sikkens (1978); G. Döring, «Der Vergleich zweier neuer Farbsysteme (ACC und NCS) mit der DIN-6164-Farbordnung», Farbe 29, pp. 53-75 (1981).